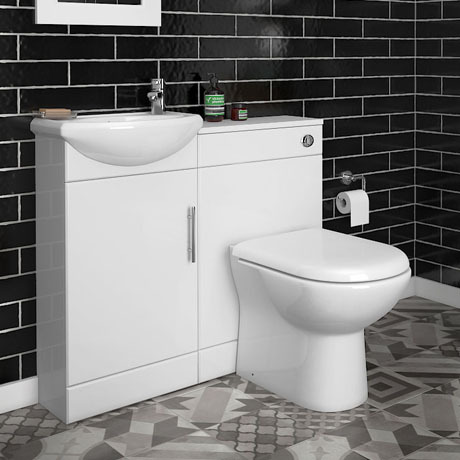 The Sienna High Gloss White Vanity Unit Cloakroom Suite. Today's Cloakroom Suites with D-shaped pan come in a variety of types and sizes, and the designs in the our range are no exception. From the timelessly traditional to the clean and contemporary, you'll find a style that's perfectly to your taste. All white gloss vanity units feature a high quality ceramic basin. Unit comes with a removable front panel which can be drilled for right or left hand front flush. Please note - tap shown in photograph not included. Hi George, in the Sienna range we only do a vanity unit 420mm in width. We do another range called Alaska which is similar and has a larger range of sizes, this also has a 300mm option. These can be viewed by typing Alaska in the search bar on the site. Thanks! Q. Does basin come complete with plug/waste connection? No, the waste will have to be purchaced seperately for this basin. Yes, the front panel clips off to gain access to fit. Hi, I am sorry, but we are unsure of your question, please connect to Live Chat at the top of our site to quickly consult a customer service team member for further help. Thank you. Q. Can the units be used as separates. Hi Wendy, Thank you for your question, yes, the Sienna units can be used separately. I hope this helps, please let me know if yo u have any further questions. Quality Product perfect for the Job. Appears to good quality although not fitted yet. Was very impressed with my units would definitely use victoria plumbing. Fantastic service,product and price. Really pleased and it looks great now fitted. Compact suite needed due to small area of room and it totally fits the bill! The basin cabinet was damaged to the rear at the back. Luckily I was able to glue it back together. It was also hidden when I installed it next to the bath.Looks great now the bathroom is complete. This item arrived within 3 days and has since been fitted. It looks and feels great. Initial faulty item was changed without hesitation. Price and service from Victorian Plumbing was excellent. Thanks.